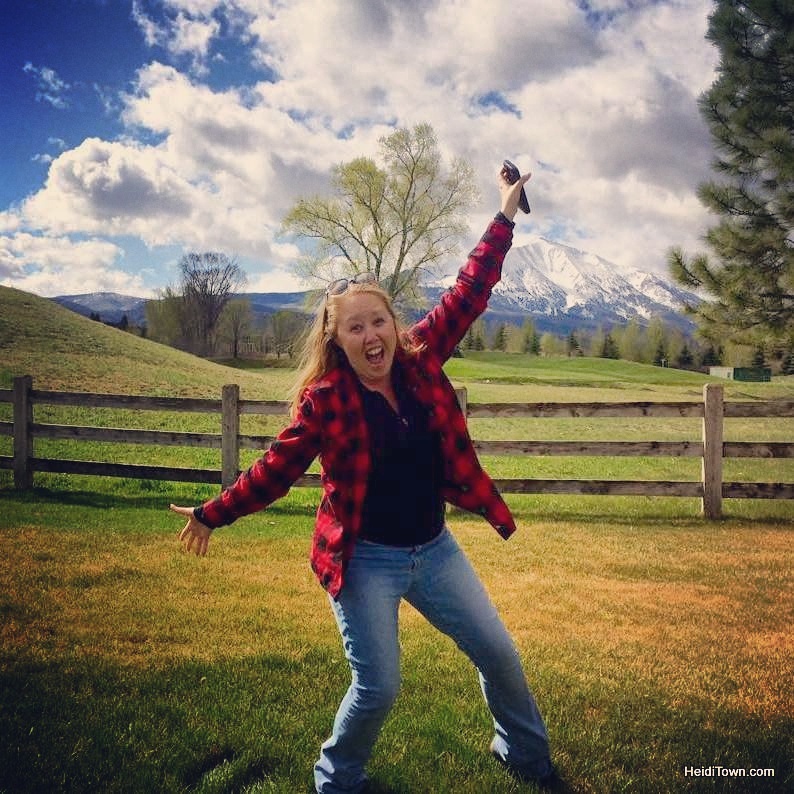 Considering a holiday getaway this month? Fort Collins is an excellent Colorado Christmas town. Downtown sparkles with thousands of lights and from Old Town Square to Oak Street Plaza Park, the atmosphere is merry. 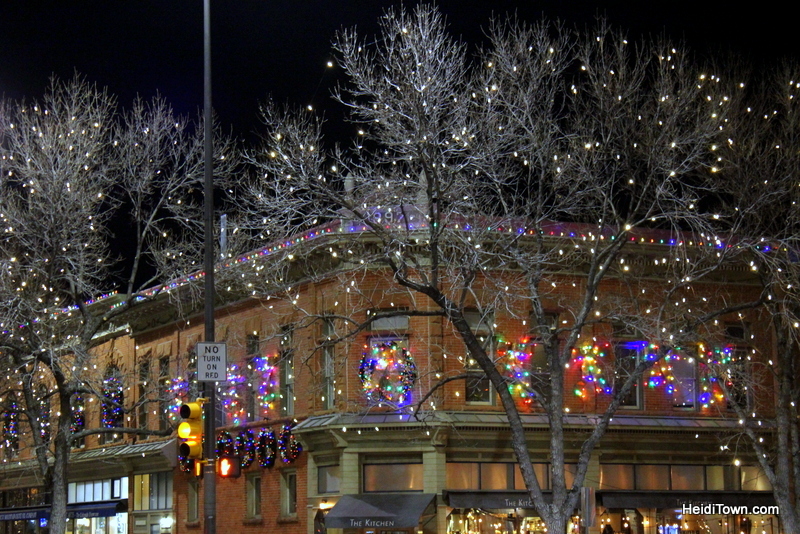 This past weekend, we did one-night getaway in Fort Collins to experience the city’s holiday offerings. 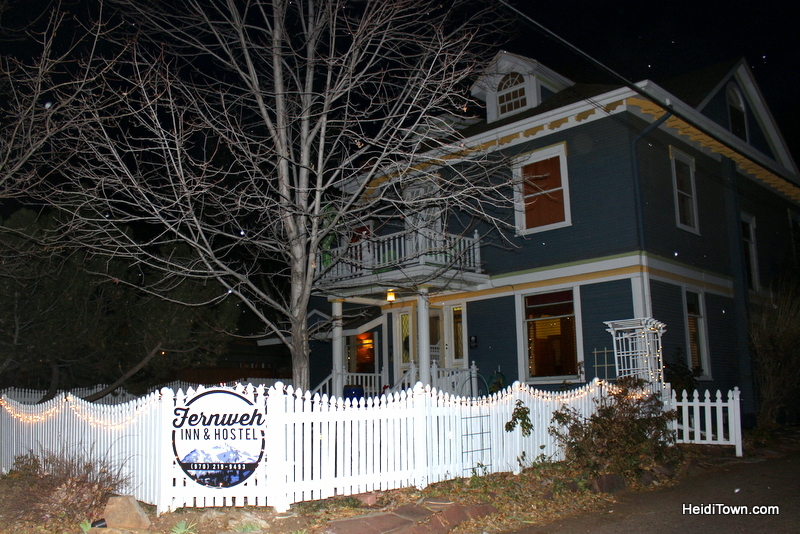 Before exploring the festive scene we checked into the Fernweh Inn & Hostel on Mulberry, just blocks from the excitement of downtown Fort Collins. Some people, including my husband, Ryan, have an aversion to any place with hostel in the name. The word makes him worried that he’s going to have to share a bathroom or wash dishes to earn his keep. Fernweh is a modern-day, American hostel which offers private rooms as well as bunk rooms. Our private room, “The Loft,” was a virtual suite because the space occupied the entire upstairs of this historic, Victorian home. There was a full bathroom in the room complete with large, soaking bathtub and multiple beds, making it perfect for a family or friends. The Fernweh changed Ryan’s mind about hostels, although he’ll still always prefer a room with a private bathroom. The things you see in the downtown streets of Fort Colllins, Colorado. We walked from Fernweh to downtown through a light falling snow. We browsed a few stores like The Cupboard, a fine kitchen store and Akinz, a clothing shop owned by local designer, Suzanne Akin. I like to pop in Akinz to buy colorful sunnies and browse Akinz’ excellent, handmade beanie selection. There are a nice selection of shops in downtown Fort Collins with something for everyone on your Christmas list. After a bit of shopping we stopped at RARE Italian for a drink using our Fort Collins Passport (2 for 1 drink coupons). A newer restaurant on the Fort Collins’ dining scene, we’d never been to RARE, and happily found ourselves staring at an affordable happy hour menu. The place has a warm atmosphere, large pours of wine and we enjoyed our $6 antipasto platter. Next up was the 25th Annual CarolFest, which kicked off at the Opera Galleria, where a holiday market was in full swing. CarolFest is a community singalong led by the Choice City Singers. We had a delightful time singing carols whilst strolling down College Avenue, through the Great Northern Hotel and into Old Town Square. I’d highly recommend this Christmassy event for anyone, including families. We had dinner reservations at another new-to-us restaurant, Blue Agave Grill. It’s a favorite among HeidiTown readers who have recommended it several times to me on HeidiTown’s Facebook page. The food certainly did not disappoint. I have a feeling I will be craving my en fuego tacos again very shortly. Good thing I took home left overs. This restaurant, located under the Fort Collins Art Museum next to Oak Street Plaza Park is a wonderful addition to the city’s food scene. Our last official stop of the evening was for music at Downtown Artery. Fort Collins’ music scene has become extremely active over the last five or so years, and it’s become a hot spots for many up and coming bands. It’s not difficult to find a live band playing on any given night and sometimes, like in our case, there’s no cover. Jennifer Lauren of Soul Revival on stage at Downtown Artery. Downtown Artery is a cafe, gallery and bar with a great little music venue in the back. Two members of the band Soul Revival were playing a free show last Friday night. 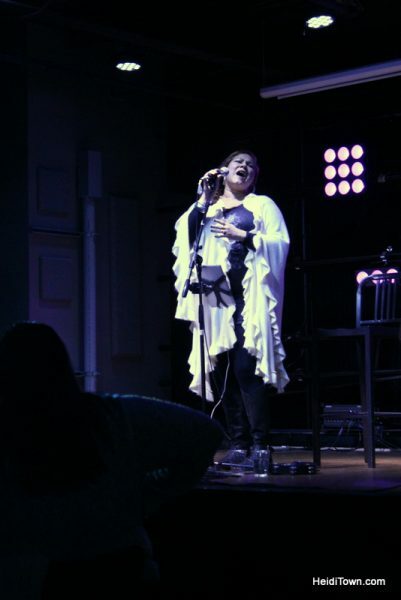 We were mesmerized as Jennifer Lauren belted out soul, gospel and R&B tunes to the accompaniment of Marshall Smith on the keyboard. While not Christmas music, soul music warms my heart in much the same way. 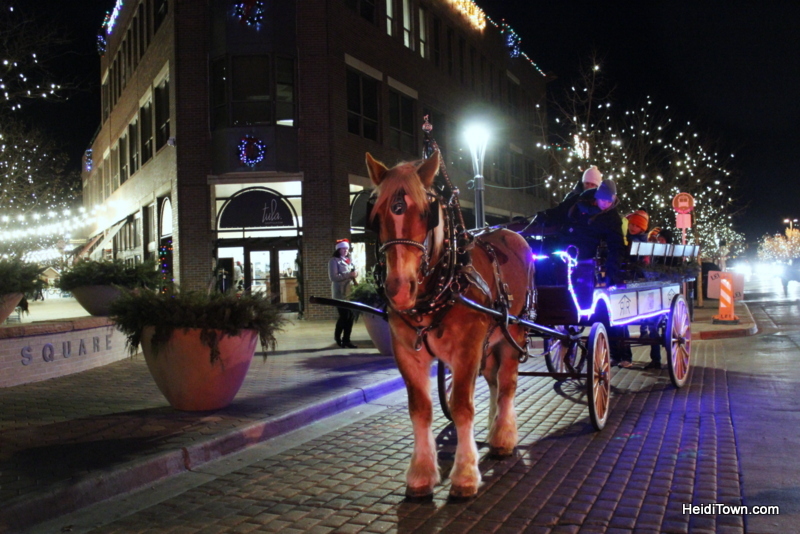 Whether you go for live music, great dining, the ice rink and Santa in Old Town Square or simply to delight in the lights of downtown, Fort Collins is a marvelous holiday destination, and a fabulous Colorado Christmas town. Thank you to Visit Fort Collins for hosting us on this trip. Thanks for your succinct but insightful look at my new home and fave perfect-sized college town. Check it out in summer when The Bohemian Foundation and Downtown Business Association and others put on at least three free music concerts a week in that fabulous weather where you can ride almost everwhere you need to go on about 280 miles of safe bike lanes on car roads, or, on 30 miles of separate trails, one along the lovely Poudre River, the only nationally designated Wild and Scenic River. Thanks for your newsletter; I quite enjoy it! Thanks for stopping in Akinz! A pleasure as always! !